This is a no-frills, get it done, kind of static content generator. It generates a one-page site. It has simple templating yet uses HTML5 and CSS3 and can be extended easily if you are willing to write some Python code. You need to install handcrank first, use pip install handcrank if you haven't done so. Handcrank can create everything you need to get you started. This creates a new directory in your home directory called mysite. This configure your site, we'll cover this in detail in the API reference. These are where your reStructuredText files go. We'll go over this in API reference. A good static site generator let's you view the site without a server. If you are on a Mac, you can type this command and view what you've created. Or File, Open in the browser of your choice will get you there as well. Remember that Handcrank uses reStructuredText. Check the Quick Reference if you want to go all rogue and put your own content in this new file. it into your generated site. It's annoying to keep going back and forth between the handbrake command, your editor, and the browser. We can take one of these annoyances away. To keep Handbrake up as a daemon, run the following command. You'll see this as the last line of the output, and notice how the command did not immediately exit. You can edit, add new docs, or change something in the template directory and Handbrake will detect this and automatically regenerate the site for you. You can continue to add pages to the site or you can dig a little deeper into extending what you already have. View the API reference to find out how. There are three main directories that you need to worry about when working with a Handcrank site. The directory locations and names can be changed using a configuration file. This directory contains only files with an rst extension. You should organize these files into a flat hierarchy, meaning there should be no sub-directories under this. drwxr-xr-x  7 robmadole  staff   238 Sep 21 22:05 .
drwxr-xr-x  8 robmadole  staff   272 Sep 21 22:05 .. This title will become the identifier for this document. This directory should contain one index.html file that represents your one-page site. See the templating section for information on how this Jinja2 template should be formatted and what data is available when the site is generated. This directory contains your generated site. If your template has a index.html, your output directory will also. Any files in the template directory will be first copied to output before the site is generated. Each site is required to have a configuration file named config.cfg. Changing the name for the [output] or [template] sections specifies a different file for the generator to look for or create. The delegate value in the [source] section is the class name of the object the generator will delegate certain behavior to. See the delegate section for more information. The generator will create an instance of this class when the time is appropriate. The important thing to note about the delegate is that a delegate.py file or delegate module putting it in Python terms will be imported. If the generator cannot find a delegate module it will fall back to a default that only alphabetizes the source list. To highlight source code, you can use the code block directive. This is copied from the Sphinx project and follows the same syntax. You can highlight other code as well, check the Pygments websites for a complete list. 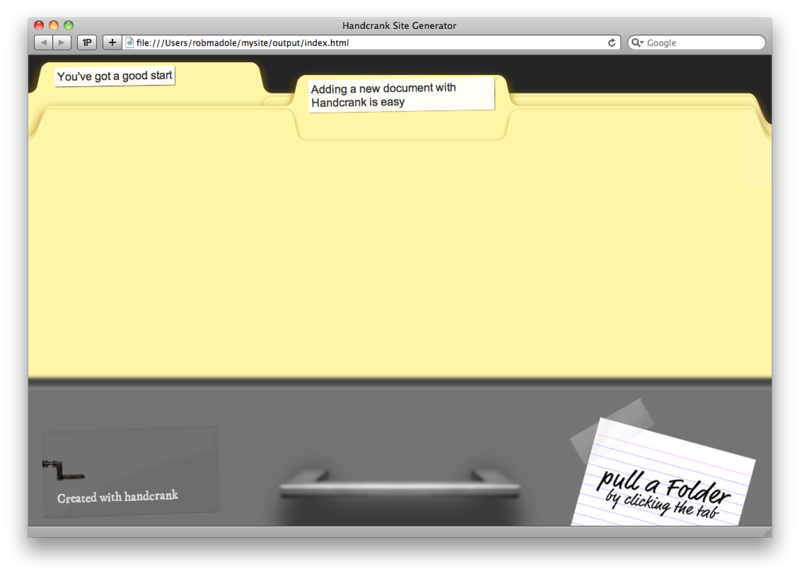 Handcrank uses a flat directory to store your rST documents. For example if you had the following directory listing in your docs directory. You can link between the documents with the :doc: role. Sites are rendered through the OnePageGenerator class. While it would certainly be possible to alter this, or better yet create a subclass, there is another alternative. Using a Delegate pattern, we can choose certain key points within the machinery to perform special calls to a delegate. A delegate alters the behavior of the generator in some specific way. Allows the order the documents appear in the page to be rearranged beyond the normal alphabetical. It's important to note that if you implement this method, you will have to call items_sort_alpha yourself as it will not happen automatically. Allows extra arguments via a dictionary to be added to the context when the Jinja2 template is rendered. The dictionary will extend the one created by the generator itself, so the only key you need to avoid is gathering. It's probably been a while since reading an introduction to Python, but recall that dict data type keys are not ordered. Because of this, we have to take special care if utilizing them in these delegate methods. If you find yourself reaching for a dict, consider using an OrderedDict instead. If you examine a source_list object coming in from the generator you'll notice that the structure is a bit unexpected. Using a list comprehension, lets look at the first 25 characters of the source. Your delegate methods do not have to return a SourceList object, but they do need to adhere to the way the iterator works. Meaning each pass through the loop needs to provide the tuple. Jinja2 is used for templating. Check out the documentation. Our main object containing the generated content is the gathering object. A list of generated documents, the key is the title like The quest and the value is an object with variables obtained from docutils html4css1 writer. Here is a very simple example index.html Jinja2 template that uses this variable. Once within the for loop, the following values are available. Assuming you have for title in gathering, it will be the first title encountered in the rST file. Like The quest. The filename of the document, like the_quest.rst. Rendered HTML representing the rest of the document, this will not include the title. The generator uses docutils, specifically the publish_parts function and the html4css1 writer, to generate the content it then renders, so you have access to more than just the information above. The example above used provide_extra_context to allow a formatted date to be added to the available data when the template renders. A dictionary is returned containing one key, time_generated. To use this within the template is fairly straight-forward. reStructuredText supports a lot of markup. This page tries to display a large combination of all of them. 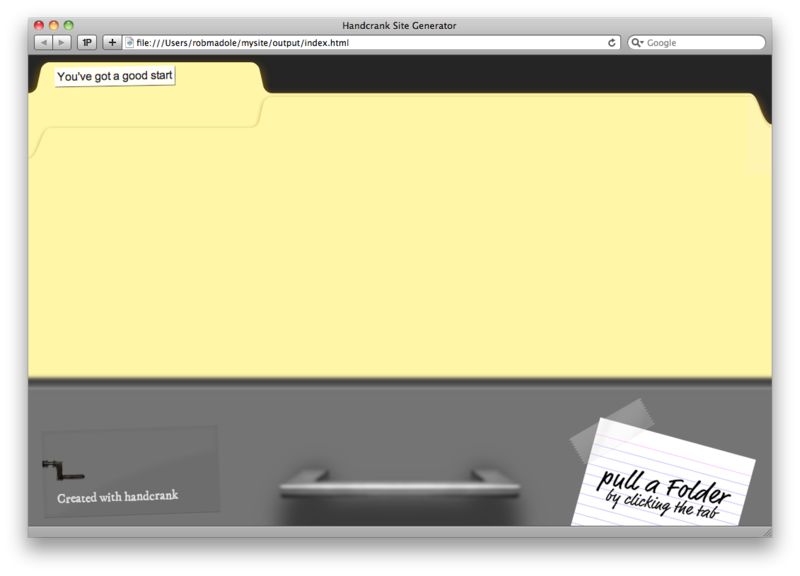 While developing handcrank, this page was used to make sure everything looks awesome. You can view the quick-start guide for reStructureText here. From there you can get to the rest of the documentation for it. This is a paragraph with a lot of text in it. Part of the text can have emphasis while other parts of it can have strong emphasis. We can also have interpreted text that has domain-specific context. An inline literal is great for putting code snippets in. Bullets are "-", "*" or "+". Continuing text must be aligned after the bullet and whitespace. A paragraph containing only two colons indicates that the following indented or quoted text is a literal block. \this) is preserved by literal blocks. will be omitted from the result. It's very convenient to use this form. > for Haskell literate programming. Continuation lines are wrapped portions of long lines; they begin with spaces in place of vertical bars. A transition marker is a horizontal line of 4 or more repeated punctuation characters. A transition should not begin or end a section or document, nor should two transitions be immediately adjacent. Footnote references, like . Note that footnotes may get rearranged, e.g., to the bottom of the "page". A numerical footnote. Note there's no colon after the ]. They may be assigned 'autonumber labels' - for instance,  and . Citation references, like [CIT2002]. Note that citations may get rearranged, e.g., to the bottom of the "page". [CIT2002] A citation (as often used in journals). Citation labels contain alphanumerics, underlines, hyphens and fullstops. Case is not significant. Given a citation like [this], one can also refer to it like this. This is an example crossreference target. Python is my favourite programming language. Here are the numerous "shoulders of giants" that I stood upon while cobbling this together. Thanks to all these projects for saving me so much time.